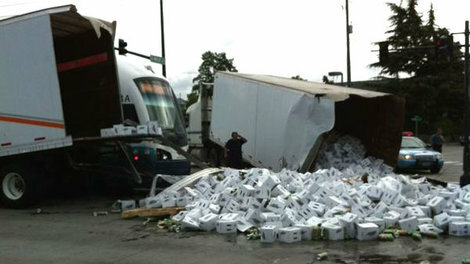 Plans to enjoy harrowing local games of Diablo III and Counterstrike in Seattle this weekend were all but dashed when a truck carrying the all-important Mountain Dew was sliced in two by light rail train in Seattle. It’s not clear at this time what caused the truck to stop on the rail tracks, but gamers should be advised to stock up as supplies could be limited. Levels of other necessary supplies, such as doritos, chex mix, cheetoes, and red vines, should also be monitored as the situation develops.